Grupo Codere SA has enabled the firm’s executive team to carry out a series of organisational reforms, designed to improve and simplify Codere’s globalised day-to-day operating structures in the Madrid SE listed company. In its update, the Codere executive details that organisational reforms are needed to simplify the firm’s regional units, enhance commercial capacities, whilst improving corporate operating margins and global synergy development. 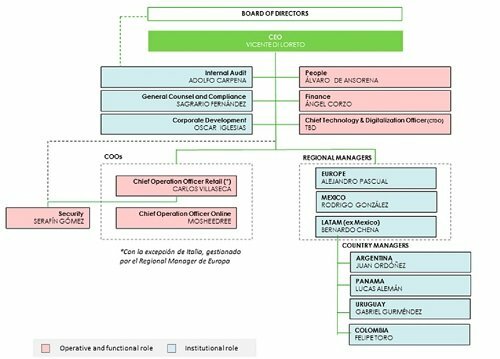 Presenting its new organisational structure, Codere’s executive splits operational and regional leadership into two separate units, reporting directly to Group Chief Executive Vicente Di Loreto. Moving forward, Codere’s commercial performance will be led by Regional General Managers – Alejandro Pascual (Europe), Rodrigo Gonzalez (Mexico) and Bernardo Chena (LATAM). The reorganisation, sees Codere’s LATAM division absorb operating teams for Argentina, Uruguay, Panama and Colombia. Supporting, Codere global operating structures, this February the firm announced the launch of its new group cloud operating system designed and developed by Telefonica and Hewlett Packard Business Enterprise. “I have the greatest confidence in our management team and in our organization. The extensive experience and talent of those who make up Codere are undoubtedly great assets with which to face the opportunities and challenges that the market presents, “said Vicente Di Loreto, general director of Grupo Codere.